The Great British Bake Off has hit the headlines as the news broke that it was leaving the BBC for Channel 4, and then a further blow came when Mel & Sue announced that they would not be following the show when it moves. I’ve also heard rumours that there might not be a series next year, and we’ll have to wait until 2018. Now we’re all waiting with baited breath to find out what Mary & Paul are going to do… I am sad to see it move channels and I really hope it doesn’t spell the end for the show. I read that more people watch GBBO than voted in the last election – so it’s a pretty important part of our culture! 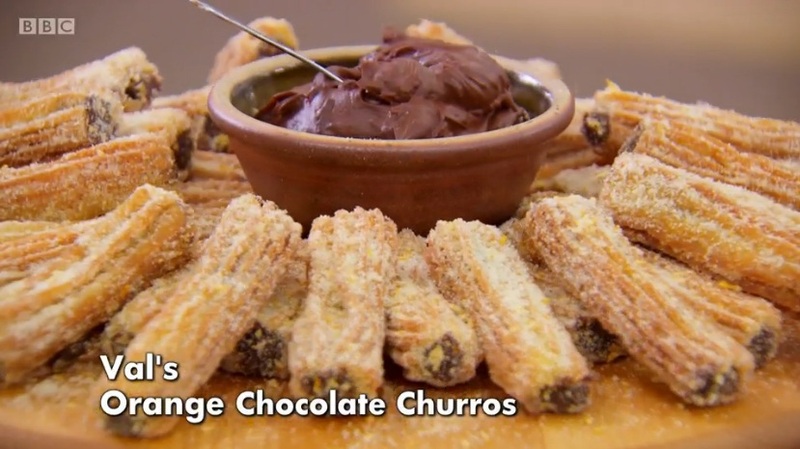 If anything can cheer us up in this uncertain time, Churros with Chocolate Dip can! Find the recipe after the episode recap. Meanwhile on week 4 of the current series, it was batter week! This is a new category for the show, and I was looking forward to seeing what they would make. 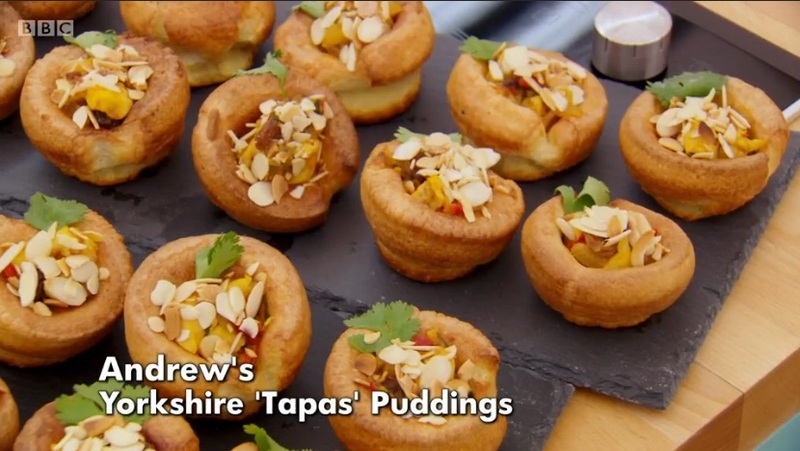 The signature challenge was filled savoury Yorkshire puddings, and the judges wanted 24 identical ones. I was quite surprised they wanted identical Yorkshires, I don’t think they ever can look the same unless they come out of a bag. Mary wanted well risen Yorkshires with a dip in the middle, but she admitted it was hard to get Yorkshires identical. Paul explained the egg in the batter gives the Yorkshire its rise, and said he wanted them to taste amazing. 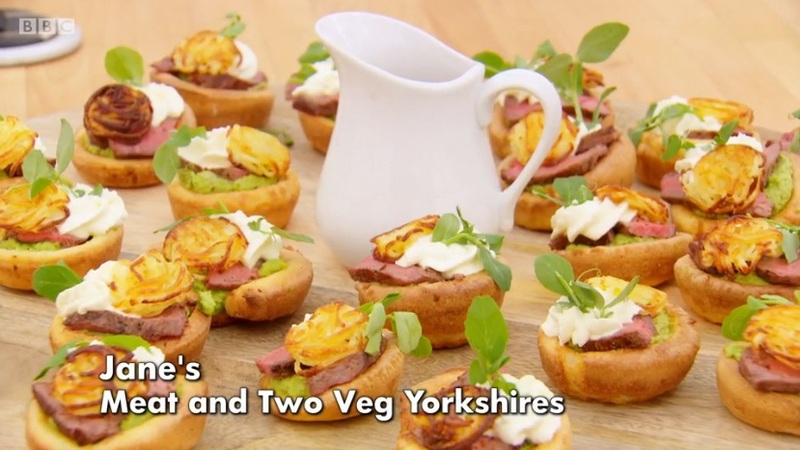 There was a lot of variance in the amount of eggs used for the Yorkshire batters. Tom used 8 eggs, Val used 5 eggs and Andrew used 4 eggs. 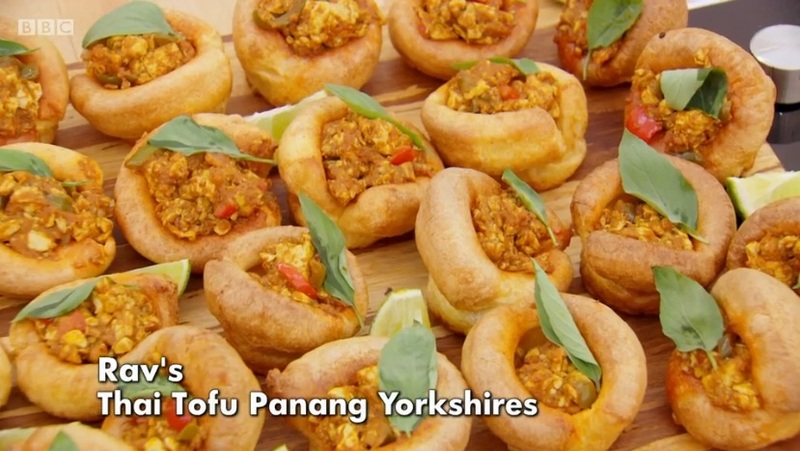 There was a lot of variety in the fillings too, from Candice’s Beef Wellington to Rav’s Tofu Curry and Andrew’s Spanish Chicken. Jane said that she has always had problems making Yorkshire puddings and her mother could never understand why she couldn’t make them. Tom was very brave and made his Yorkshires using chickpea flour, but sadly it didn’t work out for him as they did not rise. Candice’s and Jane’s Yorkshires also didn’t rise enough, whereas Selasi’s rose beyond expectation! Paul loved his roast pork filled Yorkshires and gave him a handshake with a mouth still full of pork crackling. Benjamina and Andrew did very well too, and Jane surprised with a filling that Paul loved. Paul also praised Rav’s Tofu Curry filling despite being hesitant at first. 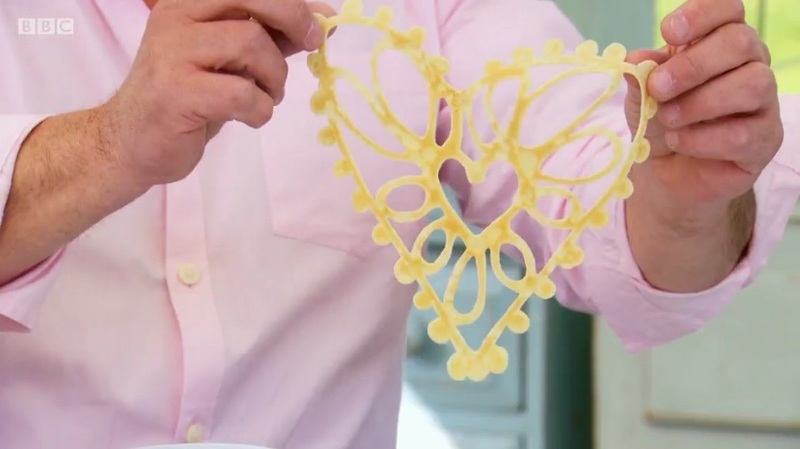 The technical challenge this week was to make 12 heart shaped lace pancakes, which must be intricate and beautiful. The bakers were allowed to make one test pancake, but the other 12 had to be served. The recipe instructions were typically detailed, and Candice kindly read them out to the viewers – “make pancake batter, that’s it”. Paul said they were taking pancake making to the next level. 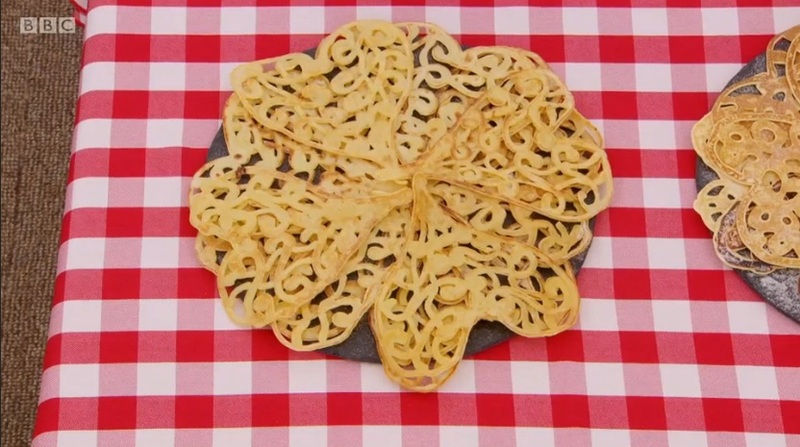 As pretty as they are, I personally think lace pancakes are quite pointless. I like a nice thick pancake with no gaps in it! The bakers all debated over how to make a pancake batter and they were all unsure how much sugar to add. They all designed their own lace hearts so pencils and notepads came out for them to doodle their chosen designs. Both Rav and Andrew didn’t seem sure what lace was and their designs were a heart with a criss cross pattern filling it. Selasi was obviously the only bake brave enough to flip his pancake for Sue, he’s such a rebel. Rav came last, Selais 8th, Kate 7th, Val 6th, Tom 5th and Andrew 4th. Jane came third, Candice second and Benjamina was first. 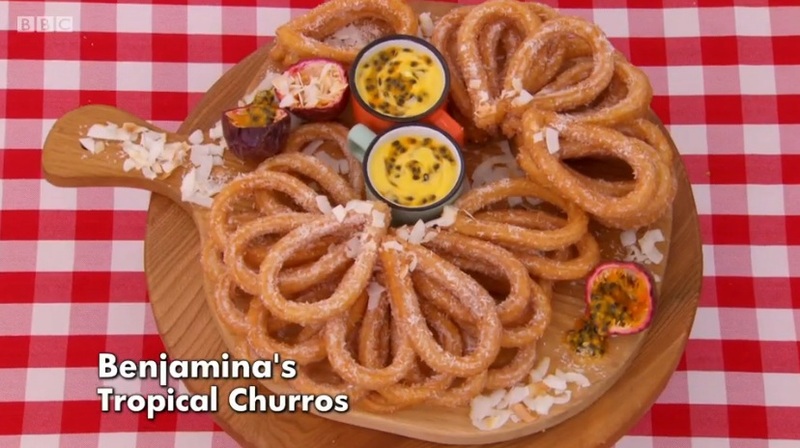 The showstopper was to make 36 sweet churros, they could be filled, flavoured and served with a dipping sauce as desired. And shockingly they had to be all identical! Paul wanted a beautiful crispy exterior and a soft inside. He warned against adding too many to the fryer as the temperature would drop and they could become too oily. Mary said turning this simple street food into a showstopper would be tricky and she wanted to see the bakers do something different. Andrew made the batter in the traditional way, which is without eggs. Other bakers added flavours to their batter; Benjamina added coconut extract and Val added orange. Tom was being experimental as usual and he added fennel to his batter, and served his churros with a saffron custard. 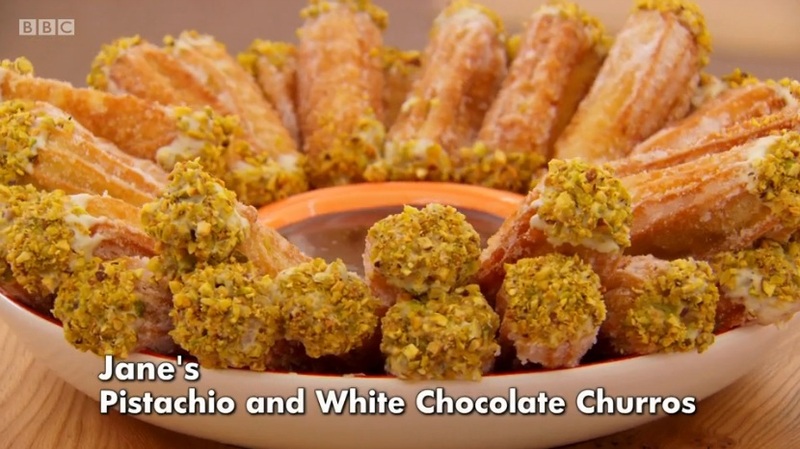 Rav chose matcha green tea powder for his churros, served with a fruit dip, a creamy dip and chocolate dip. Candice added beer and coconut flour to her batter and dipped them in peanut butter. Selasi made churro bowls which he froze before frying – I’ve tried this before and it was rather disastrous so I was worried for him! 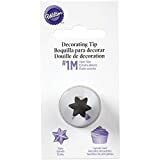 Some of the bakers cleverly piped their shaped onto baking paper and put them in the fryer still on the paper, while others piped the batter straight into the fryer. Only Val and Jane filled their churros, the judge loved the flavour of Val’s filling but said it affected the dough inside. They weren’t huge fans of Tom or Selasi’s churros either, and they said Rav’s were too fatty and had a bad flavour. Jane did very well, and Benjamina got a perfect result. Kate left this week, her Yorkshires were irregular and didn’t rise, and her churro dough was too wet so soaked up too much fat. 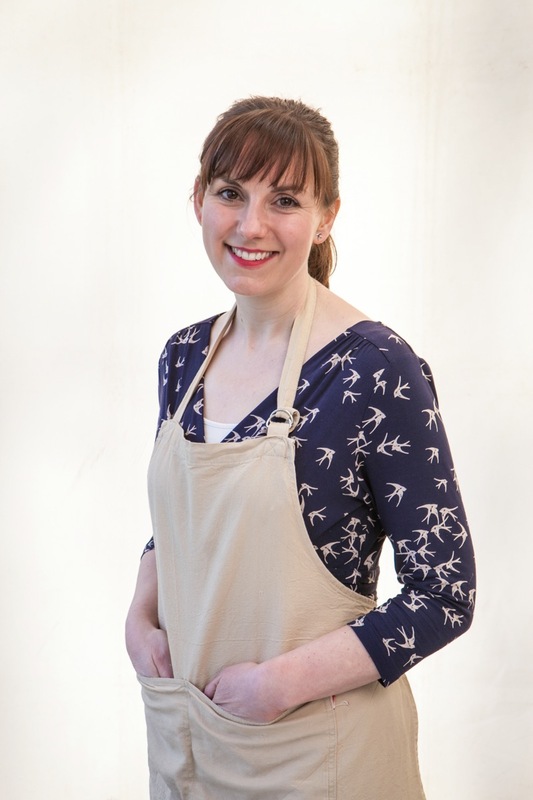 Benjamina won star baker after producing perfect churros and winning the technical – ever since biscuit week I have thought that she will be a finalist and potentially even win it…time will tell! Next week is pastry week. I decided to make churros this week because they are delicious. I’ve had them many times in Spanish and Mexican restaurants and they never disappoint. Fried dough dipped in chocolate is always going to be pretty good really isn’t it?! I started by making the dough, I sieved plain flour and baking powder into a bowl. I added a mixture of boiling water, melted butter and vanilla extract and beat it into a dough. Then I left it to rest for 15 minutes. I prepared a bowl of caster sugar and cinnamon for rolling the churros in after frying. I piped the churros out in long stick shapes using a star shaped nozzle. You can make them in any shape you like of course. I used a tip from Bake Off and kept them on pieces of baking paper as I put them in the fryer. To fry the churros I used a deep fat fryer at 180C until they were golden brown, I turned them over during frying. 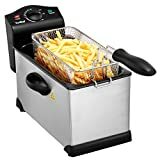 I bought this deep fat fryer from Asda for the bargain price of £14! To fry them, I used sunflower oil. I did them in batches of three so the temperature in the oil would remain the same. When they were cooked I rolled them in the cinnamon sugar. To make the chocolate sauce I melted dark chocolate with butter. Use the sauce immediately once made and getting dipping! The churros were so moreish! As predicted, the combination of fried dough, a cinnamon and sugar coating, plus chocolate dip is absolutely delectable and keeps you reaching for more, and more, and more! 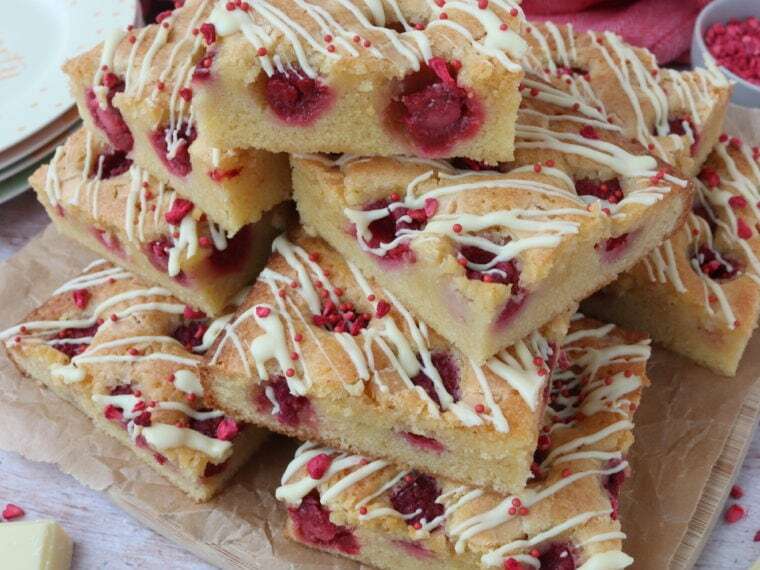 I’m linking up with the Great Bloggers Bake Off 2016 hosted by Mummy Mishaps, with Bake Off Bake Along hosted by Rhyme & Ribbons and This Particular, and with the Sunday Fitness & Food Link Up hosted by Ilkas Blog and Marathons & Motivation. You must get your hands on some churros, they are so delicious! Thank you Kate, the fryer was perfect for the job and made the process less scary. Thanks Amy, they were actually easier than I thought! You are too kind Amanda! What do u do with the boiling water, can you explain please?